This week’s pick for 15% savings is this lovely CD filled with songs specifically written to help teach invaluable social skills. Created by Dr. Jed Baker and music therapist Jeffrey Friedberg, Be A Friend motivates children to attend and learn. The catchy tunes include: Be a Friend; Hello; Personal Space; Eye Contact; Volume of Speech; Sharing; Turns; Ask to Play; Compromise; Compliment; Sensitive Topics; Teasing; Accepting No; Making Mistakes; Calm Down and Feelings. The songs on the CD are aimed towards children 2 – 10 years old generally, but mostly 4 – 8 year olds. 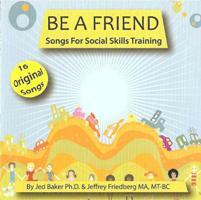 Today through March 8, visit our site at https://www.difflearn.com to save 15% on the Be A Friend: Songs for Social Skills Training CD by entering the Promo Code BLOGSSCD at checkout. *Offer expires on March 8, 2011 at 11:59 pm EST. Not compatible with any other offer. Written by: Different Roads to Learning on March 1, 2011. This entry was posted in Pick of the Week, Products, Social Skills and tagged ABA, autism education, autistic spectrum disorder, behavior management, conversational skills, developmental delays, Different Roads to Learning, generalization of skills, language development, learning, social skills, socialization by Different Roads to Learning. Bookmark the permalink.